One obvious answer is: “It’s fiction.” But even in the real world, such a large jump in LSAT score is indeed possible after months of dedicated preparation. Surprisingly, if you watch closely enough, you can learn a lot about LSAT prep from Elle Woods. Here are four incredible LSAT prep tips from Elle Woods. In one scene, Elle is shown in the library with a friend reviewing an LSAT PrepTest. The camera cuts to a group of frat boys running by with a keg outside. Elle contemplates joining them for a brief second, but she ultimately resists temptation by diving back into her studies. The lesson is obvious. Raising your score from a 143 to a 179 will take months of dedicated LSAT prep. It is critical to prioritize your goals and make short-term sacrifices so that you can achieve your long-term goals. Although it might be difficult to turn down fun parties and events, it will be worth it when you get into the law school of your dreams and possibly receive a large scholarship. Like Elle, you should party only after you receive a high score. Unfortunately for Elle, the LSAT Proctor DVD, which proctors LSAT PrepTests and simulates test-day conditions with the push of a button, was not available in 2001. Accordingly, Elle had to use an alternative approach to proctor her tests and simulate the distractions that she would face on test day. She asked her friend to proctor her test during a fitness class. As you can imagine, a room full of people exercising is clearly a distracting environment. The lesson here is one we have been teaching for many years. LSAT prep is worthless unless you gauge your progress by taking LSAT PrepTests under actual conditions. Simulate test-day conditions to ensure that your score does not drop on test day. 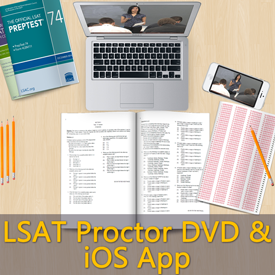 Click here to read more about the LSAT Proctor DVD, now available for immediate download on the iPhone and iPad. Elle obviously did not research good testing centers because she took her LSAT in a crowded auditorium with virtually no desk space. The lesson here is to use the free SimuGator LSAT Test Center Rater to help choose a great test center. Our database includes thousands of reviews from participants who reviewed important factors including desk space, room temperature, number of test takers in the room, noise level, lighting, testing delays, and competency of proctors. Although Elle succeeded despite her testing environment, increase your odds of getting a high score by choosing a quiet testing center with small rooms and a large amount of desk space. Test day is intimidating and full of distractions. Everything from the flipping of other people’s test booklets, to the clicking of the proctor’s shoes, to the proctor yelling “five minutes left” can throw you off your game. However, Because Elle simulated test-day conditions during her practice tests, she was able to keep a cool head and let her LSAT techniques and strategies go to work. If you follow these tips and stick to a dedicated regime of LSAT prep, increasing your score from a 143 to a 179 will go from a fictitious possibility to a definite reality.